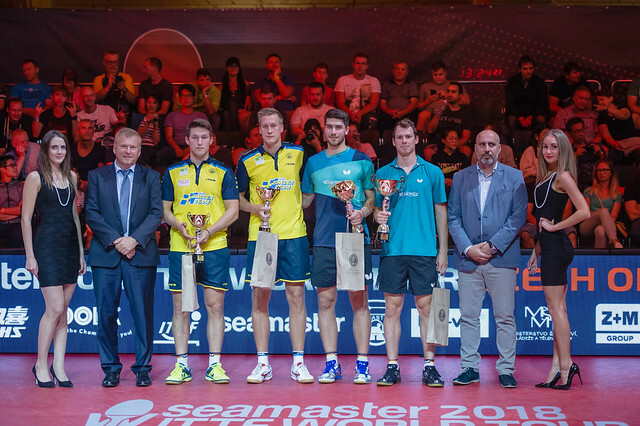 A game of two halves, it is well worn saying on a football field, on Thursday 23rd August, the phrase very much applied to the opening round of the Men’s Singles event at the Seamaster 2018 ITTF World Tour Czech Open in Olomouc. Earlier in the day, in the top half of the draw, no less than six of the eight seeds, had fallen; in the lower half it was just one. The player to cause the upset was Austria’s Daniel Habesohn, he beat Sweden’s Mattias Falck, the no.6 seed (11-9, 7-11, 3-11, 11-8, 11-6, 6-11, 11-8). Good form in the qualification tournament; equally Russia’s 31 year old Kirill Skachkov had caught the eye as had Poland’s ten years younger Marek Badowski, for both the first round was the end of adventures. Kirill Skachkov lost to Kazakhstan’s Kirill Gerassimenko, the no.14 seed, in a closely contested seven games duel (12-14, 11-6, 5-11, 11-13, 11-9, 12-10, 11-7); Marek Badowski was beaten by experience and control. He lost to Vladimir Samsonov of Belarus, the no.10 seed (13-15, 11-5, 11-7, 11-7, 12-10). Success for Vladimir Samsonov, notably there was also success for Tomokazu Harimoto, the no.2 seed and defending champion; he accounted for Slovenia’s Darko Jorgic in a most imperious manner. He prevailed in four straight games (11-9, 11-3, 11-6, 11-4). Similarly, Portugal’s Marcos Freitas, the no.4 seed and winner in Olomouc in 2014, made an authoritative start to his campaign, as did Denmark’s Jonathan Groth, the no.5 seed. Marcos Freitas recorded a straight games against Japan’s Yuki Hirano (11-6, 11-7, 12-10, 11-4); Jonathan Groth ended the progress of Poland’s Jakub Dyjas (11-2, 11-2, 7-11, 7-11, 11-7, 11-5). Opening round success for Jonathan Groth, a round where overall no less than seven of the 16 seeds had fallen. Meanwhile, not to be upstaged, Germany’s Patrick Franziska, the no.9 seed, overcame Croatia’s Tomislav Pucar (11-9, 9-11, 11-3, 11-5, 11-6); Japan’s Maharu Yoshimura, the no.11 seed, ended the hopes of Russia’s Viacheslav Burov (8-11, 12-10, 12-10, 11-4, 11-7). The second round of the Men’s Singles event will be played in entirety on Friday 24th August.